As many of you know I picked up many pumpkins this Fall and I had three last pumpkins to cook up this season. I chose this pumpkin raisin bar recipe from a forgotten file I found in my office. 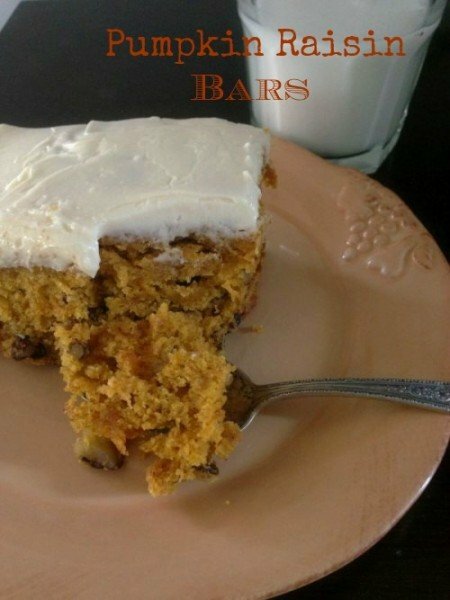 Bars are an old-fashion simple cake with a great frosting, serving enough for the entire family or a large crowd. Finding an old recipe as this one is like looking up an old friend ~I wish I visited it more often. This cake can be eaten for breakfast, an afternoon tea or anytime during the day. Do me a favor, pull out some of those old recipes and share your old-time favorites with your friends and family and stir-up some fond memories together. This delightful spicy bar dessert can be made for a large crowd or served as a cake in a smaller version for the entire family. One of my old-favorites. In a large bowl combine all the bar ingredients except nuts and raisins. Beat on low speed until moistened. Bake for 25-30 minutes or until toothpick comes out clean. Bake for 40-50 minutes if placed in a 9x13" pan. In a small bowl, combine all the frosting ingredients. I was curious how fresh pumpkin can benefit your health, so I did a little research and found so many interesting facts that I wasn’t aware of. I found the site Livestrong and found all these nutritional facts, check out their site for more facts and recipes. Fist of all it’s low in calories, has no salt and no fat. Vitamins A and C are found in pumpkin along with fiber. Minerals such as Copper, Magnesium, Calcium, Zinc, and Selenium are found. And it’s beautiful orange color has Carotenoids – great for the eyes. Don’t throw out the seeds they’re full of Oleic Acid that help lower bad LDL. You’re right – sometimes the old, standby recipes are the best. You’ve inspired me to thumb through my old recipe box. This bars look wonderful! There’s nothing wrong with posting old recipes that have some value to you and your family…in other words-memories!